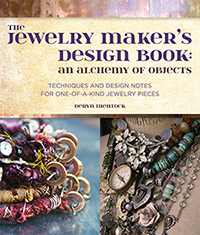 My friend, Judy Wilkenfeld has a terrific article in Stampington's new issue of Belle Armoire Jewelry (summer 2009). It's titled "Casting Call" and it's about metal casting. Judy has an Etsy store, chock full of incredible found objects, charms and cast metal pieces, perfect for use in jewelry making and mixed media. She had the genius idea to cast a perfect, antique, bisque frozen Charlotte doll (take a look at this post for the story on frozen Charlottes) in pewter and this article describes that process and gives some inspiration as to just exactly how these heavy metal babies could be put into use. Judy chose several artist friends to help her with this and I was honored to be one of them. For one of my pieces, I decided to enclose Charlotte in a little, wire birdcage. I added some of my "signature" vines and leaves and a flower with a garnet center. Charlotte wears a crown of vintage brass. ...vintage brass chain, and some incredible, faceted red tiger eye. ...then created a long dangle from more faceted garnet and a beautiful vintage religious key medal. This little darling is the focal of a three strand bracelet. She's wearing a green silk sash and is connected on either side by sterling and rhinestone connectors. I used lots of pearls, some vintage rosary chain and a length of lovely vintage tatting for the body of the bracelet. I finished it with a handmade sterling clasp and a faceted jasper drop in the perfect shade of green. If you've never seen Judy's work, you're missing something special. Every piece that Judy creates is infused with insight and soul. She's extremely talented and full of original ideas and inspirations...like little metal Charlotte! When she came up with the idea to cast these dolls, she invited several of us to use them in our jewelry creations. I was in the good company of fellow artists, Diana Frey, Ro Bruhn, Jen Crossley and Kecia Deveney. All huge talents, so you can imagine how fabulous the pieces are. We've waited a long time to see this article and Stampington did a truly wonderful job with the photography. Make sure you pick up a copy of BAJ and take a look!